Note the scopes we are asking for in this request include “user” and “public_repo”. This means the app will be able to read the user profile information as well as have access to public repos. It’s important to generate a “state” parameter to use to protect the client. This is a random string that the client generates and stores in the session. We use the state parameter as an extra security check so that when Github sends the user back here with the state in the query string, we can verify that we did actually initiate this request and it’s not an attacker making that request. We build up the authorization URL and then send the user there. The URL contains our public client ID, the redirect URL which we previously registered with Github, the scope we’re requesting, and the “state” parameter. 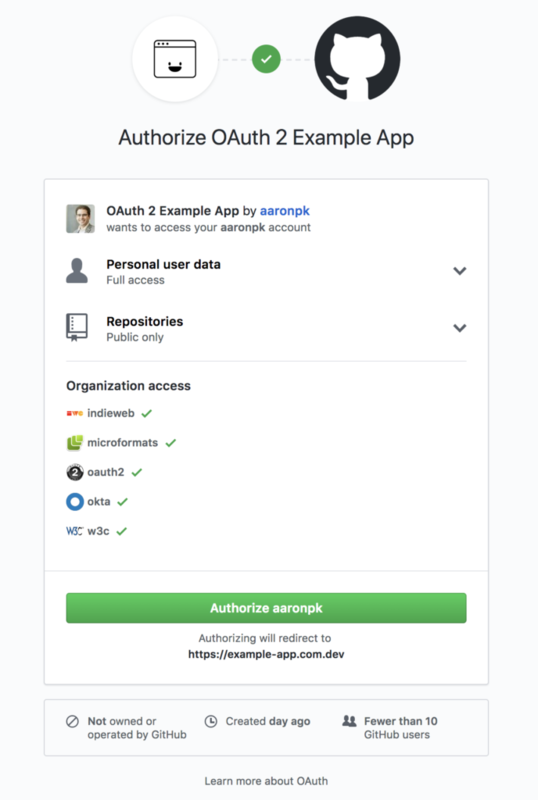 At this point, the user will see Github’s OAuth authorization prompt, illustrated above. When the user approves the request, they will be redirected back to our page with code and state parameters in the request. The next step is to exchange the authorization code for an access token.